The Queensland Reds have named prop James Slipper as captain for the 2015 Super Rugby season, with the 25-year-old to be supported by two new vice-captains in Reds and Wallabies lock Rob Simmons and recent signing Karmichael Hunt. This leaves former leaders Will Genia, James Horwill, and former Wallabies vice-captain Quade Cooper outside the leadership positions, in a surprising move by the Reds. Slipper takes over from James Horwill, who will leave Australian rugby after this year’s World Cup in September-October after signing a three-year deal with English side Harlequins. 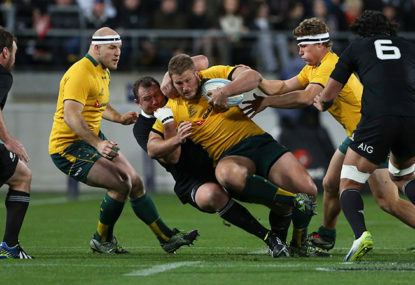 Slipper was the Wallabies vice-captain throughout the 2014 international season, and has played 65 Super Rugby matches to go with his 63 Test matches. But the big surprise has to be the inclusion of Karmichael Hunt as vice-captain, along with Rob Simmons. This will be Hunt’s first season of Super Rugby, having played a season in France with Biarritz. “I’m incredibly humbled by this decision. I take great pride in playing for Queensland, so to be named captain is a great honour,” Slipper said in a club statement. Queensland Rugby CEO Jim Carmichael said that it “Is a very deliberate and considered decision to ensure the best outcomes for the Reds and Queensland Rugby in 2015 and beyond. Hunt said he was confident the despite a lack of experience, he can do the job both on the field and as vice captaing. Reds coach Richard Graham thanked Horwill for his commitment to the club but was confident they had made the right calls with the new leadership group. “Everyone knows James Horwill is a passionate Queenslander who plays with an incredible amount of pride. It is important that he helps with this transition and I have no doubts he will provide a wealth of support to James Slipper, who has proven with his actions both on and off the field he will be a strong leader for this team,” Graham said. “In appointing two new vice-captains, we are continuing to expand the leadership base within our group. Rob understands the strategic side of the game well and deserves an opportunity to be part of the leadership group. Having an official title will provide some more formal opportunities for him to lead within the team. “While Karmichael is new to the team, he has shown throughout his career and during Reds pre-season that his standards and work ethic will drive the group to higher expectations. “As with any team, it is important that we continue to provide opportunities for players to grow – and that includes in their ability to lead. “All of these guys have been appointed because of what I believe they can bring to the leadership role, but they are by no means the only leaders within our group. “We are also fortunate to have four players in our squad who have had the honour of representing Queensland more than 100 times in their careers. Quade Cooper, Will Genia, Greg Holmes and James Horwill, all very experienced players, have held leadership roles within the Reds at various times. They are already leaders within this group so they don’t need to carry a formal title. Horwill is the most-capped captain in the state’s history – having led the Reds on 69 occasions over his eight-year tenure as skipper. “While I love captaining Queensland, I think it’s the best thing for the team to allow the leaders within the group to grow. All the players who have been selected have my 100% support and I’m excited to see what they can do not only this season, but for many years to come,” Horwill said.